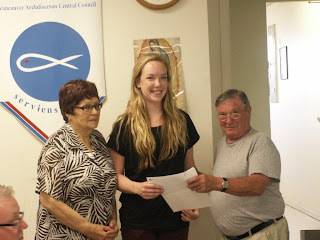 The Vancouver Archdiocesan Central Council of the Society of the Society St. Vincent de Paul, having been appointed Administrators of the Betty O'Flynn Memorial Fund, is pleased to sponsor a $500 bursary for full-time post-secondary studies directed towards a career – which in the opinion of the Memorial Fund Committee members- supports life issues. Applications should be submitted to the Society’s address marked for the attention of the Bursary Fund Committee and must be received by July 15 of application year. The successful candidate will be notified by August 15 and the bursary will be paid upon confirmation of enrollment in courses commencing in the fall of the award year. Renewal applications will be considered based on proof of educational attainment. The bursary will be presented by a member of the Society at a brief ceremony held in the candidate’s local area. Complete the application, attach any supporting letters, and send by mail or in person to 2741 Main St. Vancouver, BC. V5T 3E9.